Hotel Polonez is located in central Krakow, 1,2 km from the Main Market Square. It offers classically furnished rooms with air conditioning, free WiFi and cable TV. There is also free on-site parking.All rooms at the Polonez are decorated with warm, bright tones. Each comes with a private bathroom with a shower. A hairdryer is provided. A buffet breakfast is served every morning in the hotel restaurant, which offers Polish and European dishes.Front desk staff is available 24 hours a day and can assist with luggage storage, store guests’ valuables in the hotel safe or arrange laundry services. 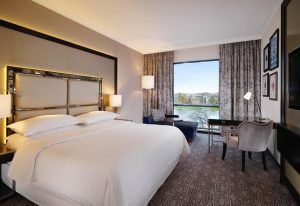 Radisson Blu is a 5-star hotel, located just a 7-minute walk of Kraków’s Main Market Square and the Royal Wawel Castle. It offers spacious and air-conditioned rooms with free Wi-Fi. Free access to sauna and a fitness club is provided. All non-smoking rooms at the Radisson Blu are classically furnished and bright. Each comes with tea and coffee-making facilities and a luxurious bathroom with a bathtub. Some have a seating area. A varied buffet breakfast is served every morning at the Solfez restaurant. Guests can enjoy international and seafood dishes at the Milk&Co restaurant or a wide selection of coffee at Salt&Co bar. For guests travelling with small children the hotel offers bath toys and cosmetics, as well as bathrobes and slippers. Front desk staff is available 24 hours a day and can arrange concierge service. A beauty salon and massage treatments are available. Guests can rent out bicycles for free. Radisson Blu Hotel Kraków is located only 1.5 km from Kraków Główny Railway Station. City’s main attractions are located within just a few-minute walk. The Vienna House Easy Chopin Cracow is located in the city centre, directly opposite Cracow Opera House and nearby the Tauron Arena Kraków, in a business and commercial district. The Old Town with its medieval market square is just a short walk away. The hotel is famed locally for its great cuisine. Those are promising words. 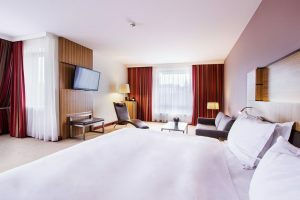 220 rooms, accessible rooms & one Apartment, restaurant, bar & sun terrace, relaxing area with hair salon, 5 flexible conference rooms for up to 285 people, reception & bar service, free high-speed WiFi, hotel parking spaces, situated in the city centre, opposite Cracow Opera House, about 1 km from the Old Town. Economy hotel for business and leisure. The hotel is located close to Vistula Boulevards and offers easy access to Wawel, the old town, the Kazimierz district, airport and other important sites in Krakow. 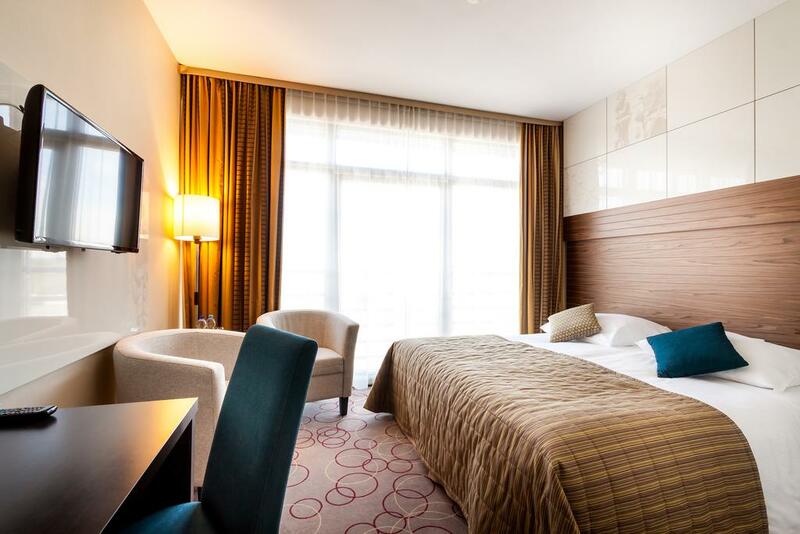 Enjoy comfortable rooms, the spacious ibis Kitchen restaurant and an underground car park, and with the Novotel Krakow Centrum hotel nearby, you can guarantee a successful stay in this royal city. Excellent location, close to the Wawel Castle, Market Square, the Cloth Hall and Kazimierz – the Jewish District. Economy hotel for business and leisure. The hotel is located in the center of Krakow, a 15-minute walk from the old town and near to the train station and the bus station, which is only a 30-minute ride from Krakow-Balice Airport. Our comfortable rooms are what ibis is all about. Together with our spacious ibis Kitchen restaurant and modern conference space, they guarantee an enjoyable stay in Krakow. Qubus Kraków Hotel is located in a quiet, yet central area of Kraków, next to the Vistula River. It features a rooftop swimming pool and a hot tub with impressive views of the city. All air-conditioned rooms at the Qubus are fitted with free WiFi and satellite TV. Each comes with a minibar and a safety deposit box. Most bathrooms have a bathtub. In the morning guests can enjoy an award-winning breakfast buffet. The Kraków Hotel’s restaurant, Ogień, specialises in Polish and European cuisine. The hotel breakfast consists of over 100 fresh products, including regional smoked sausages, cheese, salads and hot dishes. Qubus Kraków Hotel is situated in a beautiful area of Podgórze District, within a 10-minute walk from Kazimierz Jewish District. The Main Market Square is just 2 kilometres away.